One-sided and negligible as a resource with which to study its subject, “Zionism Unsettled” says a lot more about Christian Anti-Zionism and the way in which religion can unsettle political discourse, not just on the right, but even on the left. In this case, the pamphlet-authors press a variegated political ideology and nation state, one founded on principles specific to the history of Jewish secular culture and politics, through the theological lens of Christian doctrine, as conceived by its authors. To prove a pre-conceived point, the narrative-survey and accompanying photographs are dominated by rightwing Revisionists like Ze’ev Jabotinsky, Menachem Begin, Benjamin Netanyahu and the rightwing religious zealots of Gush Emunim who came to dominate the religious-Zionist camp in the 1970s and 1980s such as Zvi Yehudah Kook, Moshe Levinger and Hanan Porat. Maps detail Palestinian dispossession in the State of Israel and in the occupied territories alongside photograph of racist anti-Arab Israeli Jewish graffiti. The selective history and the choice of photographs are part of the central argument in the pamphlet, which is that Zionism, seen mostly or essentially as a theological doctrine, constitutes the root cause of the Israeli-Palestinian conflict. Rather than see its history as a liberal movement or a political movement dominated in its heyday by socialists committed to universal norms and principles of social justice, rather than see the conflict over Palestine in political terms, Zionism is presented as a doctrine of exceptionalism, a “false theology” that is at once political and theological. “Exceptionalism” is defined primarily as the destructive, presumably sinful, notion that one’s own people is unique and special and therefore absolved from universal rules, laws, or principles. Zionism is presented, tout court, as a doctrine which “[puts] believer-insiders above the law they expect nonbeliever-outsiders to obey” (8), as “covenant based,” more sacral than secular (15, 31ff, 56), a form of Constantinian Judaism (16). These are the theological rubrics that are supposed to explain, at root, the allegedly essential and inevitable collision between two national movements, one Palestinian, one Jewish, and the dispossession of the one by the other. One could overlook as an unexceptional feature of this kind of discourse the failure to consider the violent resistance on the part of Palestinian society as contributing to the hardening of anti-Arab attitudes in Jewish Palestine in the 1930s and 1940s prior to the 1948 War of Independence or in Israel to this day. The sole cause of the suffering of the Palestinian people is ascribed always to others, to Zionism or to the international community, not, in part, as a result of their own political miscalculations, or to the machinations of neighboring Arab regimes. There is one mention of suicide bombers killing civilians during the Second Intifada, used principally to defame by quoting out of context the liberal American-Israeli thinker David Hartman, a thinker who devoted himself to the uphill tasks of promoting religious pluralism and social justice in Israel, but who’s represented here as advancing genocide (p.41). Less unexceptional and more telling of the program to which the pamphlet authors want to commit their readers is the insert by Joseph Massad of Columbia University, suggesting that there is, in fact, no Israel-Palestine “conflict.” Just as was the case in Algeria, Zimbabwe, and South Africa, there is no conflict based on competing national rights, just a form of settler colonialism that must be resisted radically, root and branch (p.47). In coming to terms with the Holocaust as a buttress of international support for the Zionism and for the establishment of the State of Israel, the pamphlet cites Mustafa Abu Sway, a professor of Islamic Philosophy at Al-Quds University. By way of shifting attention from the Holocaust, in a section devoted to an “Islamic Theology of the Holocaust,” the pamphlet presents his view that the Qu’ran constitutes an inclusive scripture in contrast to the exclusive nature of Zionism (p.49). The pamphlet supports the apologetic view that when Muslims act unjustly, it’s because they misinterpret Qu’ran, as opposed to Zionism which hinges on the putative tribal elements of Old Testament religion. An “Islamic Theology of the Holocaust” sets up the larger discussion in the chapter, “A Palestinian Muslim Experience With Zionism,” a caption underneath a photograph of a group of Palestinian refugees reading, “Untold numbers of Palestinians murdered during the 1948 Nakba.” Placed immediately after a discussion of the Holocaust, the photograph and caption suggest that Nakba was another form of genocide not different in kind. (One wonders if the children in this photograph were intended to recall the infamous picture from the Warsaw Ghetto of the doomed child surrounded by Nazi storm troopers with his arms held up [p.49]). The photograph with its caption are then followed by an insert including a statement by one Shimon Gapso who in a mayoral run made explicitly racist appeals to exclude Arabs from Upper Nazareth that were deeply reminiscent of the Nuremberg laws. To make the point clear, “Nakba and Shoa” are later described as “twinned catastrophes” in another photo-caption (p.57). As an alternative to the Constantinian Judaism represented by Zionism, the Jewish theology of liberation on offer in the pamphlet cites Rabbi Brant Rosen from Jewish Voice for Peace. Rosen recommends to Jews that they should not celebrate Independence Day as a day memorializing Jewish national liberation from depredations such as the Holocaust, but rather mark it with soul searching (chesbon nefesh) and repentance (teshuva). But the form of Jewish Liberation at hand turns out to be another form of Christian supersesionism. As presented by the Reverend Naim Ateek of Jerusalem in material extracted from Justice and Only Justice, the Old Testament is understood as composed of three distinct strata. The first is defined by the tribal God, that gives way to a Torah-centered form of Pharasaic [sic] religion, completed by the prophetic universal consummation best represented in the New Testament. In this light, Zionism is “retrogressive,” representing only the most primitive [sic] and exclusive component-segments of the Old Testament (p.33). These theological stakes pounded hard in “Zionism Unsettled” bear around the difference between true religion and false religion. Not quite understanding the terminological difference in contemporary Jewish discourse between “diaspora” and “exile,” what the pamphlet recommends is diasporism, a universalistic religion celebrating Jewish life outside of Israel (pp.48ff), while blaming Zionism for the uprooting of Jewish life in the larger Middle East. In the same way that Muslim scholars and thinkers are brought in to undercut for Christian readers the narrative of Jewish suffering represented by the Holocaust, Jewish thinkers such as Mordecai Kaplan and Marc Ellis are cited, in one case out context, in the other case not, to make sure the reader understands that Zionism is form of “idolatry” founded on the idea of exclusive chosenness not much different than other forms of racial, ethnic, caste supremacy (p.34). 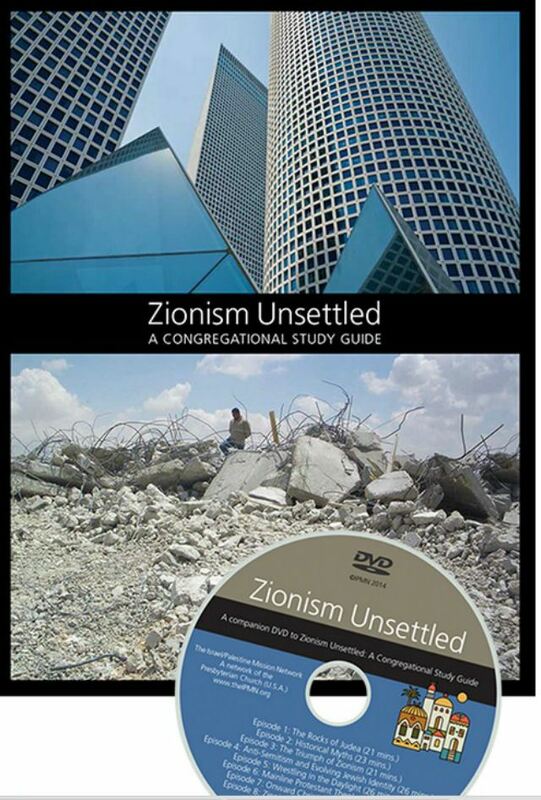 The pamphlet authors of “Zionism Unsettled” are therefore unable to understand that for mid century Protestant liberals, support of Zionism was based on what was considered at the time understood to be prophetic principles of justice and restoration (p.38), and not just by liberal Protestants, but by communists like Jean Paul Sartre and socialists like Pete Seeger. Pushing their own version of Christian supersessionism, the pamphlet authors fail to see this because they have already pegged Zionism as Nazi-tribal, which was definitely not Mordecai Kaplan’s point. In the pamphlet, Zionism and Nazism are both presented as closed systems devoted to blood and soil with no room for prophetic critique (p.38). Refusing to acknowledge the wide support across the larger Jewish community for Israel, considered by the authors to be an idol on par with the Nazi state, the implication is that the Jews, never once described as a people, have their true place out in the world, not in Palestine. Naim Ateek gets the major last and most important, even extraordinary word of “Zionism Unsettled,” his words used by the pamphlet authors to transform the critique of Zionism as a political ideology into nothing less than a Christian-religious imperative to uproot heresy. His is the view embraced in the pamphlet that Zionism is false theology (p.56), citing “Kairos Palestine –A Moment of Truth” (2009) in order to make the point that “The occupation of Palestinian land” is a “sin against God and humanity…[distorting} the image of God” in both Palestinians as an occupied people and in the Israeli occupier. One presumes that the term “occupation” refers to any “occupied Palestinian land,” on this or that side of the Green Line, an ambiguity that is no doubt deliberate. But to make sure the reader understands what he or she has just read, the pamphlet authors explain, “The casual reader may miss the severity of these charges. It is the equivalent of declaring Zionism heretical, a doctrine that fosters both political and theological injustice. This is the strongest condemnation that a Christian confession can make against any doctrine that promotes death rather than life.” According to the pamphlet-authors, heresy, and nothing less than heresy, is why committed Christians are enjoined to root out the ideology in question (pp.57-8). It’s this that explains why the very last chapter of “Zionism Unsettled” provides suggestions for unbranding biblical references to “Israel” and “Zion” from Christian liturgy, in order to purify the liturgy from politically and theologically noxious content. So in the end, the Presbyterian Church is supposed to turn not just against Zionism, but against itself, as represented liturgically. I would love to hear how this document, condemned by many Church leaders, has actually circulated throughout the Presbyterian community, and with what response. That this document remains on sale at the Presbyterian Church website itself remains a strange thought. One can only imagine the improbable scene of mainline members of Presbyterian study groups, young and old, sitting down to work through the claims offered up in this teaching resource. Perhaps the picture is intended to look exactly like the photograph, posted above, from the Leader’s Guide section of the pamphlet, in which the authors suggest, “Because of the volume of material provided, the eight-week format…is highly recommended. Your group will want to process what they experience during the sessions and to discern what it is God may be calling them to do after the series is completed” (p.64). Indeed, what does God call me to do? Misleading and ugly, what makes “Zionism Unsettled” a standout offender in the history of Christian-Jewish polemics is the peculiar theological-political motive conflating political ideology with false theology embraced explicitly in terms of an anti-heretical impulse with deep roots in Christian tradition. This entry was posted in Politics and Religion, Religion and Society, Religion and Theory and tagged “Zionism Unsettled, Al-Quds University, Benjamin Netanyahu, David Hartman, Hanan Porat, Jean Paul Sartre, Joseph Massad, Marc Ellis, Menachem Begin, Mordecai Kaplan, Moshe Levinger, Pete Seeger, Presbyterian Church, Rabbi Brant Rosen, Reverend Naim Ateek, Shimon Gapso, supersesionism, Zachary Braiterman, Ze’ev Jabotinsky, Zvi Yehudah Kook. Bookmark the permalink. This is unsettling (no pun intended), to say the least. Thanks for drawing this out.